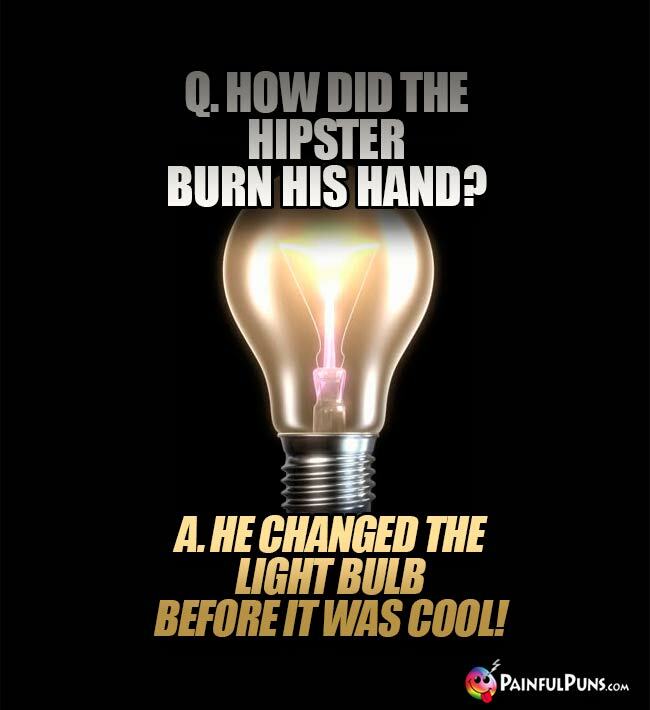 Shed light on illuminating humor, brilliant puns, screwy LOLs and enlightening lightbulb jokes. Warning: Change At Your Own Risk! 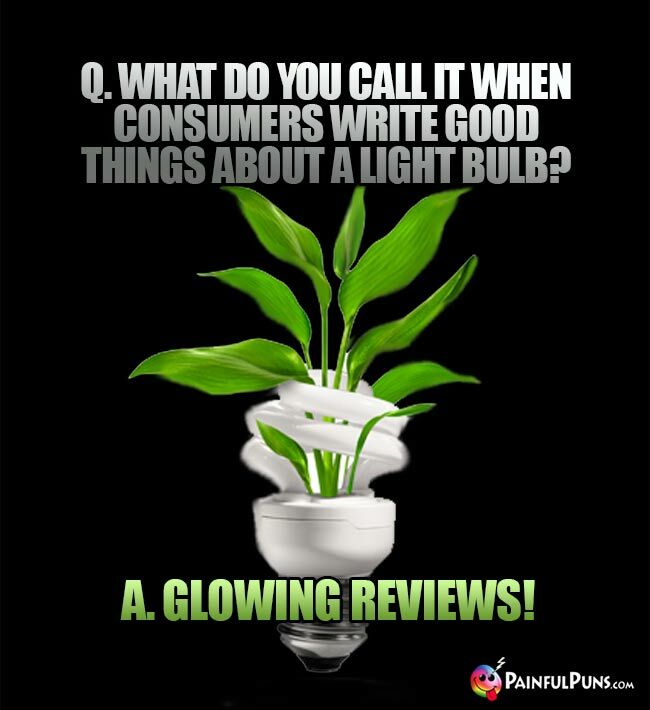 Screwy lightbulb jokes, light humor, and glowing light bulb puns ahead. Q. What do you get if you cross thought and a light bulb? Q. 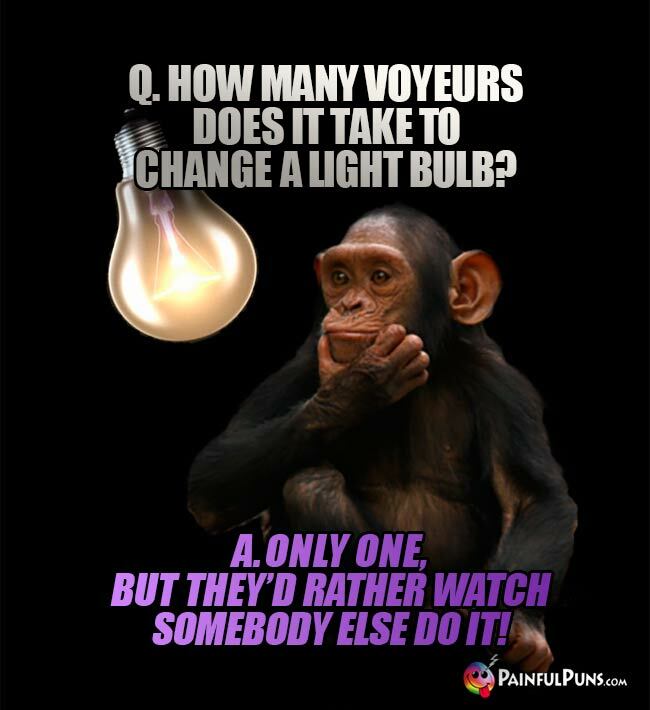 How many bar flies does it take to change a light bulb? A. Two. One to hold the bulb, and one to keep drinking until the room spins. Q. How many Who Dunnit writers does it take to change a light bulb? A. Two. One to screw it in almost all the way, and a second to give it a surprising twist at the end. Q. 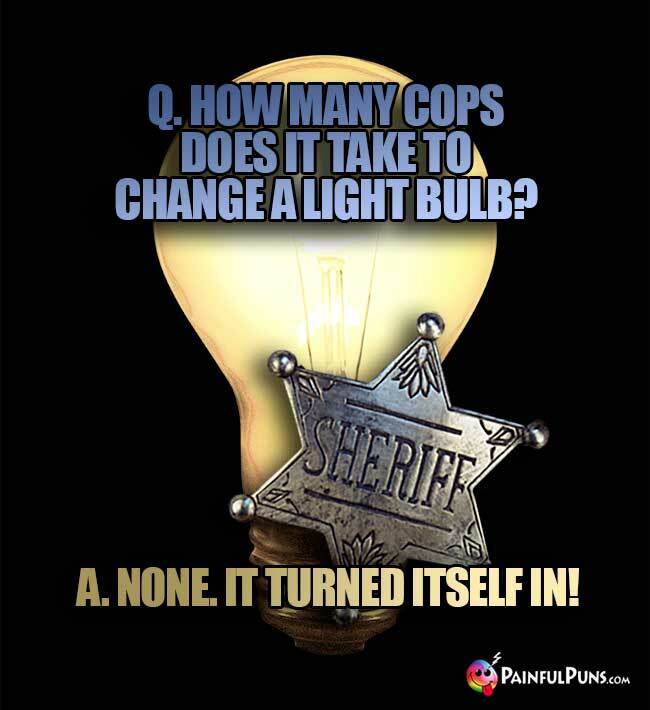 How many police officers does it take to change a light bulb? A. None. They just beat the room for being black. Q. What did the light bulb say to the generator? A. I really get a charge out of you! Q. 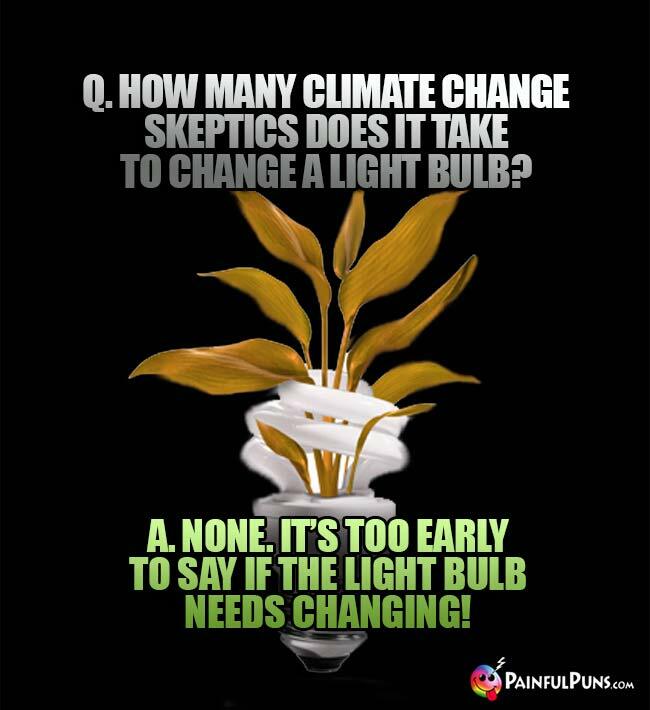 How many environmentalists does it take to change a light bulb? A. What? If the light bulb is out, that's what Mother Nature intended! Q. 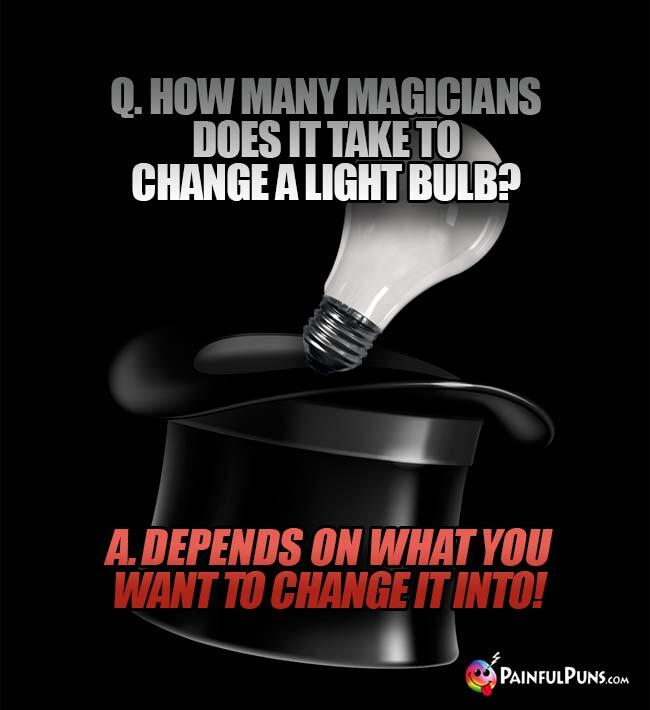 How many magicians does it take to change a light bulb? A. It depends what you want it changed into. Q. 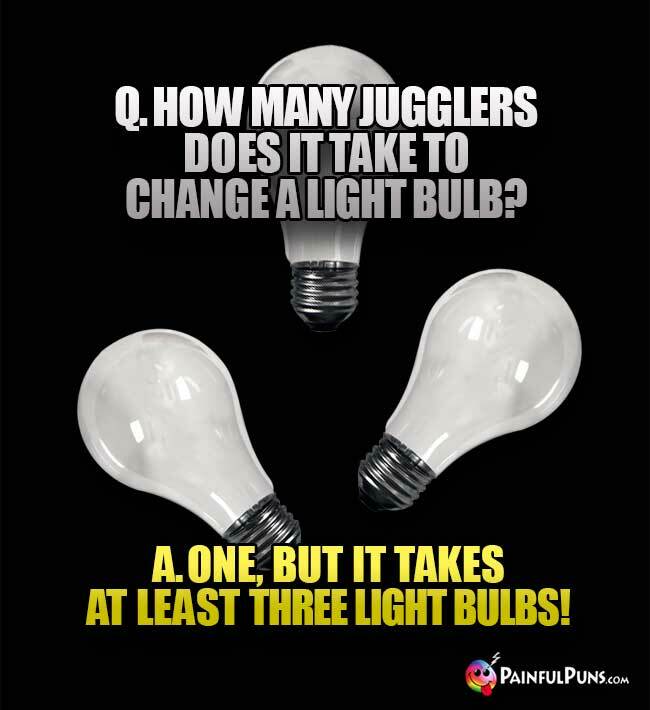 How many birds does it take to change a light bulb? A. Toucan do it, and pair-ots will tell everybody about it. Q. 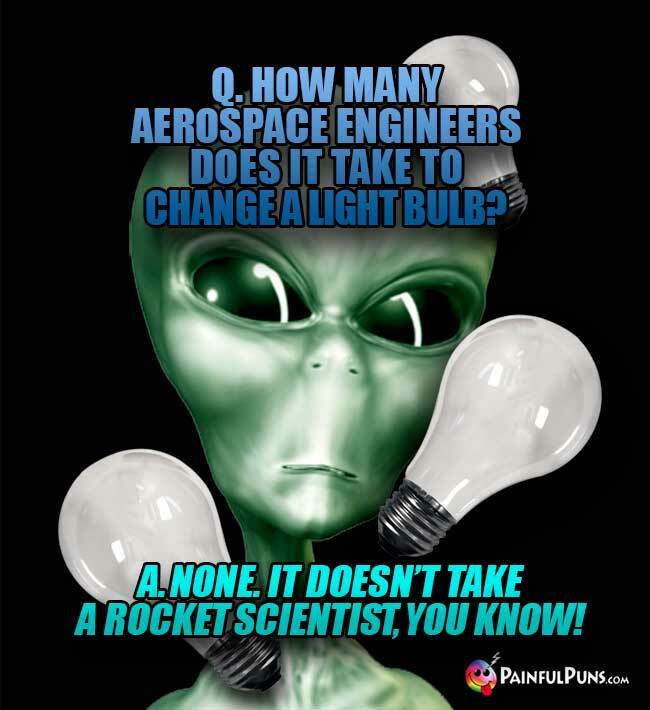 How many nuclear engineers does it take to change a light bulb? A. Ten. 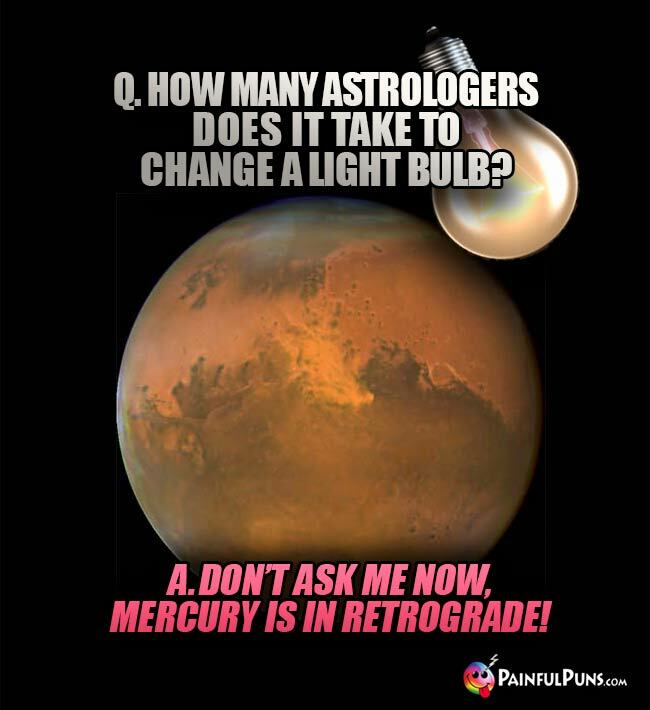 One to change the bulb, and nine to figure out what to do with the old one for the next 20,000 years. Q. How many Carl Sagans does it take to change a light bulb? A. Billions and billions. Light bulbs are part of interstellare goo that pervades our universe; they are star stuff! Q. How many squirrels does it take to change a light bulb? A. None. Squirrels only change bulbs that are NUT broken. Q. How many spammers does it take to screw in a light bulb? A. None. But, they'll offer to sell everybody in the www world a quick and profitable way to do it. Q. 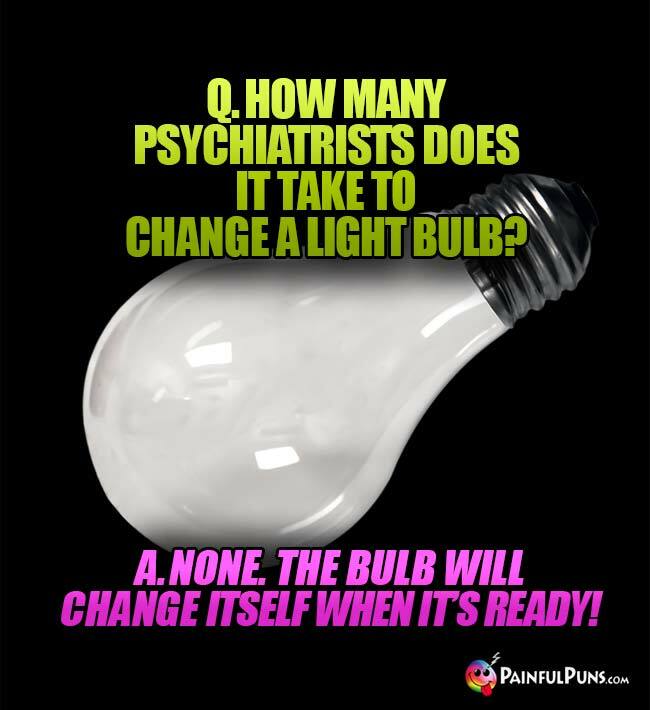 How many shrinks does it take to change a light bulb? A. 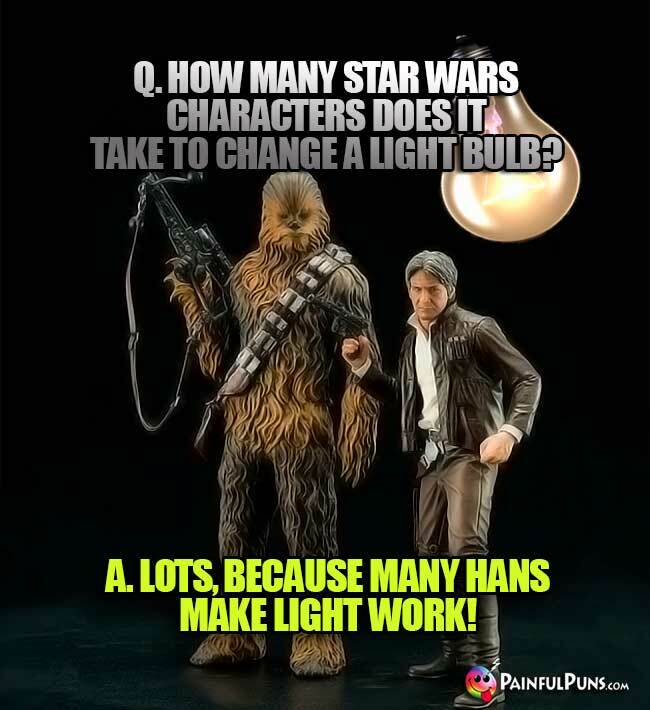 One, but the bulb really has to watt to change! Q. 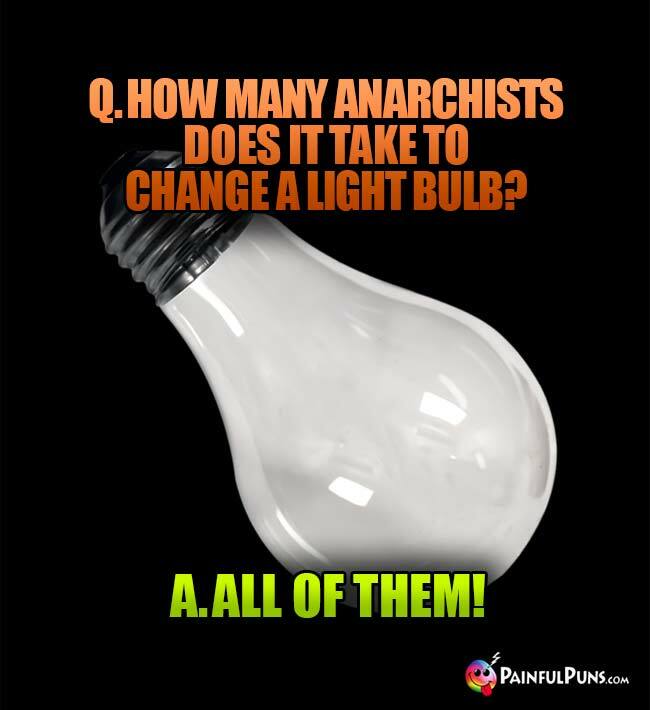 How many fatalists does it take to change a light bulb? A. What does it matter? We're all going to die anyway! Q. How many sorority girls does it take to change a light bulb? A. Three. One to screw in the bulb, and two to design the T-shirts. 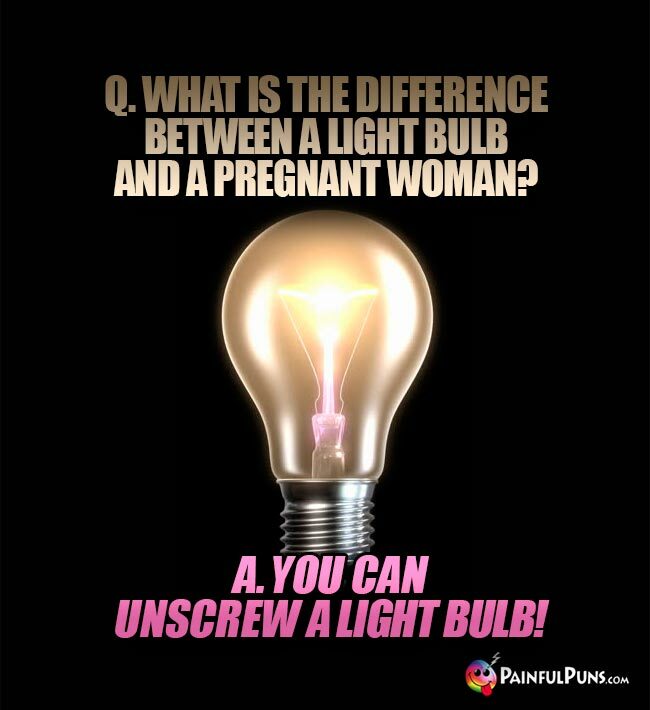 A. Um, does it really have to be a light bulb? Q. How many robot engineers does it take to change a light bulb? Q. Why did the lights go out? A. Because they were filled with delight. A. Two, but nobody knows how they got in there! A. One, but he needs at least three bulbs. Q. How many seventies disco dancers does it take to change a light bulb? A. Two. One to boogie up the ladder, and one to say, "Get Down!" Q. 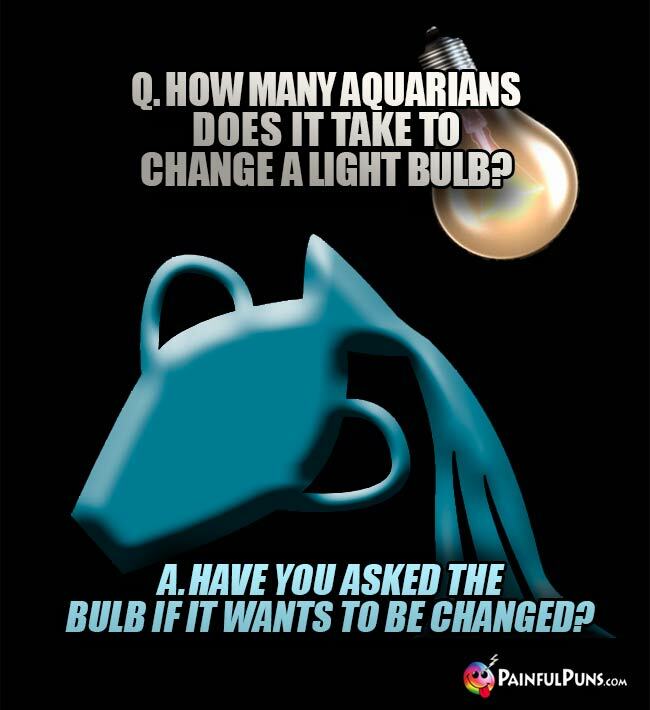 How many Aquarians does it take to change a light bulb? A. I'm tired of all your questions and I'm just going to ignore your darkness. Q. 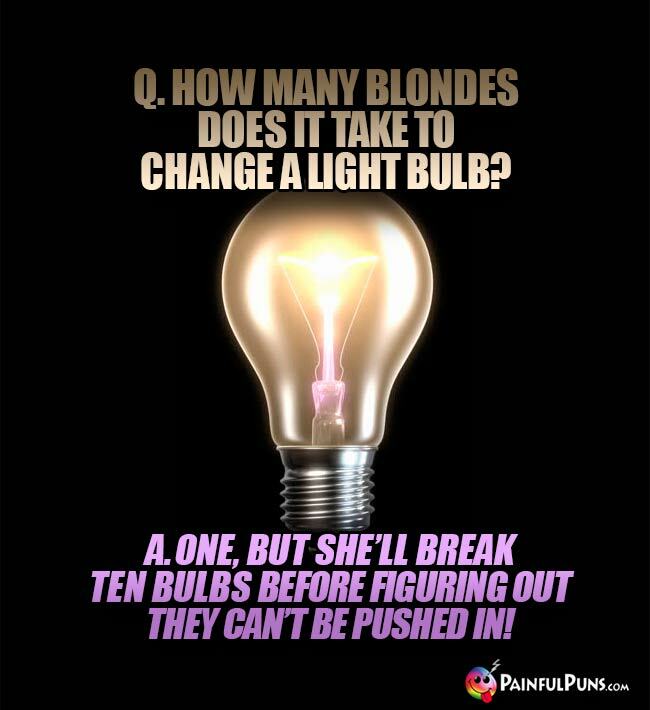 How many dumb blondes does it take to screw in a light bulb? A. Um, what's a light bulb? Q. How many real women does it take to change a light bulb? A. None. Real women have real men around.